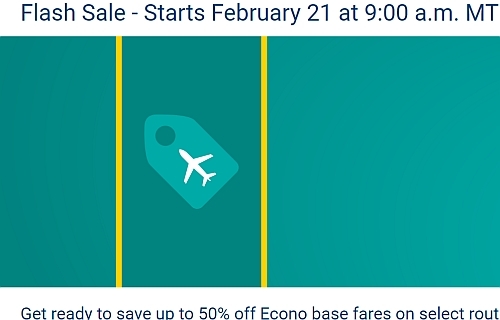 On Wednesday, February 21st at 9:00 AM MST, WestJet is going to be offering a discount of 50% off base fares on 500 seats to Puerto Vallarta, Mexico City, and Montego Bay, Jamaica. The discount is available from many Canadian cities. Just how good of a deal this will turn out to be depends on what price level WestJet has their prices set at from your city when the flash sale starts. Just as an estimate, if there are currently flights available for around $550 roundtrip, the flash sale price should be around $350 roundtrip. If the current flight price is around $450 or less, it's possible there could be some flash sale prices available in the low $300s roundtrip (possibly even the high $200s roundtrip). 2. On Google Flights, change the departure city to your city. - note that the 50% base fare discount applies to Tuesday, Wednesday, and Thursday flights only. Update 2/21 @ 9:00 AM MST - None of the flash sales are working. I think WestJet has loaded the wrong coupon codes. Usually they are 7 or 8 characters in length. These ones are 5.